Pancreatic cancer begins when abnormal cells in the pancreas start growing uncontrollably. 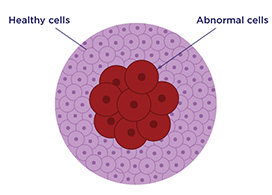 There are 2 types of pancreatic cancer cells which determine the type of pancreatic cancer that develops. Learn about possible causes and risk factors that may lead to pancreatic cancer. For more information about pancreatic cancer, go to cancer.org an American Cancer Society website.